Early in Jessica Hagedorn’s fourth novel, Toxicology, filmmaker Mimi Smith is confronted on a New York subway by a poetry-spouting homeless man who asks her “Can you help me out with some change or a piece of wisdom?” Mimi, as we learn during the course of this sharp-edged and energetically creative novel, is unable to give much of anything—wisdom, love, a helping hand—to anyone. She’s a taker, not a giver. “Her world was a hostile, brutal place, a brothel to be navigated with exquisite care,” Ms. Hagedorn writes of Mimi, one of the three women she examines in anthropological detail in her story of New Yorkers on the edge. One of the other two is Mimi’s 14-year-old daughter Violet, escaping into fantasies of pop stardom with the help of drugs and trash TV; and 70-year-old Eleanor, a has-been writer of some former note still deeply in mourning for her dead lover Yvonne. Neatly distributed along three successive generations, all three women use and abuse each other’s misery to ease their own, and it is to Ms. Hagedorn’s credit that as bleak as all this sounds, an odd kind of love flourishes between them. The Philippine-born Ms. Hagedorn first appeared on the critical radar with her 1990 novel Dogeaters, a searing dissection of the tensions between post-colonial Filipinos and the country’s youth drawn to a new kind of foreign hegemony in the icons of western pop culture. With two succeeding novels, two collections of short stories and poetry, several plays and three works of nonfiction under her belt by now, Ms. Hagedorn isn’t afraid to plunge up to the elbows into the messier aspects of human relations, locating a fertile hunting ground in contemporary New York, where she now lives. 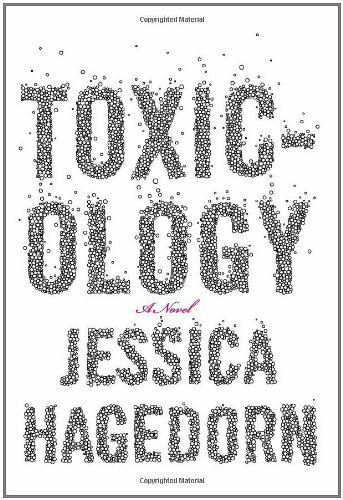 Like much of her earlier work, Toxicology is strewn with pop references, opening with the Heath Ledger-like death by accidental overdose of a Twitter-favorite movie star and moving on to sightings of everyone from the Olsen twins to Natalie Portman. Mimi herself is hovering on the edge of fame after directing a slasher film called Blood Wedding that’s become a modest cult hit, while Eleanor has retreated from her own former cult status as a writer of lesbian literary erotica and is terrified of appearing at a reading intended to resuscitate her career. To ease these and other struggles, much cocaine is consumed in the course of the story, a lot of it by Eleanor, who also deals in the drug and is Mimi’s main supplier. Hovering in the background is the only off-note in Ms. Hagedorn’s tale, a backstory of a Filipino cousin working in New Jersey as a nanny and possibly murdered by her employers. While consistent with Ms. Hagedorn’s past attentions to the struggles of Filipino-Americans and third-world women in general, this added element seems at odds with a main story tightly focused on three main female characters intricately assimilated into New York culture. Eleanor is Ms. Hagedorn’s most impressive creation, a fascinating character who comes to dominate the last third of the book as she emerges from self-pity and drug-addled memories of Yvonne to become the heroine of the story with an act of self-sacrifice of which Mimi takes full advantage. It’s Eleanor who anchors the story, even when Ms. Hagedorn’s explosive narrative pace is sometimes broken by excursions into more experimental forms. “Writing’s not for sissies,” Eleanor quotes Hemingway at one point. “Novels inflict the most pain.” But in Ms. Hagedorn’s hands, they can bring us closer to being fully human, too.